To a hunter there is no time more precious than those magical moments just before dawn on the first day of buck season. As you quietly sit in your tree stand surrounded by the inky blackness the anticipation of the coming day is nearly overwhelming. Your senses come alive; you strain your ears to detect the faintest sounds and peer into the night with woefully inadequate eyes. The trees, logs and stumps so familiar in daylight now appear as strange distorted shapes. Your imagination runs wild transforming these vague, eerie shapes into majestic big-racked bucks. I pity the timid souls who allow their fear of the darkness to deprive them of this enchanting time. They sit in parked cars and drink coffee waiting for the light to give them courage to venture forth. They know not what they miss. In 1988, Pennsylvania's buck season opened on a cold, windy, rainy day. As usual, I was in my tree stand an hour before first light; and since I had previously taken a seven point whitetail in archery season, today I was but an observer. Or, so I thought. Approximately a quarter mile away my wife sat in her tree stand; at least I hoped she did. Her stand was nearly 18 feet high and the hand over hand climb up the bull rope was a long and difficult one. I prayed she'd safely made it, but I had no way of knowing. Slowly, almost imperceptibly, the sky grew pale in the East and the darkness gave way to the dawn. Gradually the woods began to come alive. I saw two groups of deer, six in one bunch and four in another; just silent ghostly gray shapes drifting past like smoke. From somewhere across the hollow an owl hooted, and then, far in the distance I heard the muffled report of a rifle shot. I always wonder about that first shot. Was it the first shot in the entire state; who fired it and did they get the buck? Questions not meant to be answered. A few minutes past seven I was startled by a thundering boom that rang out from the direction of my wife's stand. After giving her enough time to field-dress her buck "without my assistance," I descended from my stand and went to see her deer. I was nearly 100 yards out through the woods when I first caught sight of my wife, but even at that distance I immediately perceived that something was wrong. Rather than sitting complaisantly by her precisely hit buck, she was on her hands and knees inspecting the wet leaves that covered the forest floor. 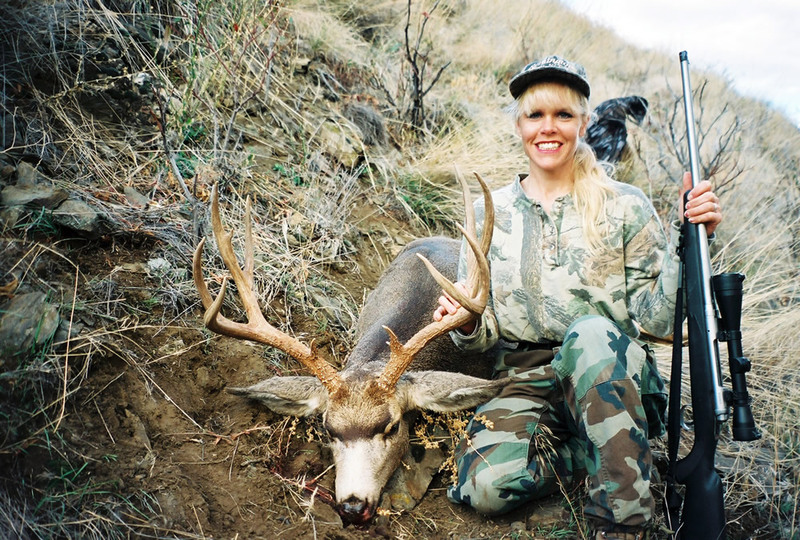 Momentarily, I was standing beside her and she was relating how a nice six-point buck had come slowly walking out of the brush not 50 yards from her stand; how she had shot and how the buck had dashed out of sight showing no obvious signs of being hit. As is our procedure in a situation like this, my wife promptly abandoned her fruitless search in the wet leaves and climbed back into her tree stand. From this greatly improved vantage point she then directed me to the area where the buck had been when fired upon. After a few moments of careful observation, I found a small crater in the dirt which had surely been made by a bullets impact. Then, approximately 5 feet to the left of the bullet crater I noticed a single nickle sized drop of blood. As I crawled over to inspect the drop of blood, I inadvertently placed my hand on a 4-inch piece of jagged leg bone fragment! With all possibilities of a miss or superficial wound now removed, I called my wife down and showed her what I had found. I then glanced at my watch and we began to track the buck. It was 8:20 a.m.
Down the hill we went on our hands and knees following the buck's line of flight in the wet leaves as best we could. Nearly 50 yards beyond the first drop of blood we found another. The buck had jumped a log and when he landed a single crimson drop had fallen to the ground. After jumping the log the buck then slowed from a run and started to walk. Now there were no skid marks or overturned leaves to follow and we soon lost the trail. In desperation, we marked the last confirmed sign and then methodically began to search the area in ever widening circles. Believe it or not, roughly 140 yards beyond the last sign we found another drop of blood. This single drop was on a well-used deer trail, so logically we went down the trail scrutinizing every inch of ground as we went. Within 30 yards we found another drop of blood, and then another, and soon we were following a legitimate blood trail. On we went drop by drop while the distance grew longer and time passed unacknowledged. Eventually, the trail led us to a deep ditch made by a spring creek and it was obvious that the buck had inflicted greater damage to himself by jumping this ditch. Where previously we followed sparsely spaced drops, we now followed a scarlet byway. Not far from where he jumped the ditch the buck lay down for the first time. Perhaps he sensed that the severity of his wound had increased. If we had not unwittingly scared him, he might have laid there and died. Unfortunately, we bumped him out of this bed long before we were aware of it. More than a mile past the bed we came to the big creek. It was easy to see his tracks in the mud where he had entered and exited the water and then gone into the weed field beyond. But, in the waist high weed field we could find no evidence of his passing. It was as though he had grown wings and simply flew away. We spent a long time searching the field. After coming so far against all odds, being defeated by a weed field was unacceptable. Resolutely, I started walking the perimeter of the field, knowing full well that if he went in he had to emerge somewhere, unless he lay dead in the field. As I walked along searching I began to think; what would I do if I were this buck? Where would I go? Then it came to me; on the far side of the field there was a place where the old barbed wire fence was broken down. In the past I had seen deer cross there many times. If I were a wounded buck, that's where I would go. There in the mud at the downed fence were familiar fresh deer tracks. I followed those tracks back towards the bend in the creek, and right at the edge of the water I found more blood. (The buck had doubled back.) Overjoyed, I began to shout for my wife who was still diligently searching the weed field. Directly across the creek there was a large upturned oak tree. When I started to shout for my wife, the wounded buck stood up from amongst its branches! For one long second we stared into each others' eyes, and then in a flash, the buck whirled and ran. I literally screamed for my wife!!! Standing there without a rifle watching that wounded buck run away was maddening. I charged across the creek through freezing thigh deep water and found the buck's second bed in the blow down. There was considerable blood and judging from the way he ran off, I knew he must be weak. Promptly, my wife was on the other side of the creek inquiring what had happened. After a quick powwow we decided I would continue to track the buck while my wife ran ahead and posted in a likely crossing spot. After my wife ran out of sight, I once again slowly started to follow the blood trail. 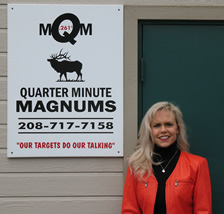 I had only gone perhaps 300 yards when I heard my wife shoot for the second and final time that day. I looked at my watch; it was 5:00 pm. In a perfect world every bullet would fly true and all game animals would instantly fall in their tracks. Unfortunately, this world is not perfect and even the most skillful hunter sometimes misdirects a shot. Yet, as the preceding story poignantly illustrates, just because an animal is accidently wounded does not necessarily mean that it must be lost. Most certainly not ! By following some simple systematic procedures, most wounded game can be recovered. So, with the hope of helping one hunter fine one animal that may have otherwise been lost, I would like to share with you my field proven system for recovering wounded game. First and foremost, if you shoot at an animal you must always assume you hit it. Never begin with the assumption that your shot missed! By assuming your shot flew true, you psychologically commit to finding the animal and therefore devote every ounce of your energy to recovering it. If you prematurely assume that you missed, you will only give it a halfhearted effort at best. Second, watch closely how the animal reacts to the shot. When an animal gets hit with an arrow or bullet, it will usually show some visible reaction. If interpreted properly, this reaction can provide valuable clues helpful to recovering the animal. However, unless you are intentionally looking to see this split second reaction, you will probably miss it. Third, mentally mark the spot where the animal was when you shot. The exact spot ! Now, burn it into your mind. Fourth, watch precisely where the animal goes as it runs away. Not just the general direction, but the exact line of flight. Also, it is very important to note the last place you saw him just as he goes out of sight. Sixth, willfully lock your eyes back on the spot where the animal was when you fired. Now very slowly start walking straight to that spot. Do not take your eyes off that spot or allow yourself to be distracted in any way. When possible, the shooter should remain in place and direct another person to the spot. Seventh, with a bit of luck you should now be standing at the place you believe the animal was when you shot at it. Mark this spot ! Even if there are obvious signs of a hit you should still mark it. You may need to find this spot again later and it is amazing how often it seems to start raining or snowing at the most inopportune times. Eighth, if there are not obvious signs of a hit you should get down on your hands and knees and really scrutinize the immediate area. Remember to think small. You're looking for blood, not blotches the size of a basketball, but specks no bigger than a grain of sand. Look also for hair; when a broadhead or bullet makes contact with an animal it cuts hair. Sometimes big fluffy tufts, sometimes only little strands. Look for any physical evidence that would indicate a hit. These would include blood, hair, bone fragments, stomach contents and intestinal matter. Anything that should be on or in the animal that isn't. Now, after a thorough search, let us suppose you haven't found any signs of a hit. You may not be at the right spot. Go back to the place you fired from and take another look. OK, you've done that and you're convinced this is the right spot, but you still can't find anything that would confirm a hit. Don't give up yet ! ! ! Remember, you mentally marked his path of travel as he ran out of sight. When hoofed animals run, their hooves dig in and they make noticeable tracks. You must find those tracks and follow them. The farther you can follow the tracks, the greater the odds are of determining if your shot hit or missed. If after following the tracks for at least 150 yards you have still found no evidence that would confirm a hit, it is then "reasonably safe" to assume you missed. However, the only way you can be absolutely positive you missed is by finding where your bullet hit. Obviously, this will not always be possible. But, if you can find where your bullet hit a tree, plowed into the ground or was deflected by a limb, not only will you know that it did indeed miss, you'll also know why. If your shot connected you probably will not need to follow the tracks very far until you find blood; usually less than 50 yards. The amount of blood you find means virtually nothing. I have tracked deer that were hardly bleeding and found them deader than a doornail 100 yards from where they were hit. I have also tracked deer that bled so profusely over the course of a mile that I figured they must be receiving transfusions along the way. When tracking wounded game take nothing for granted. Wild animals are incredibly tough and can literally run dead on their feet. Once, during a white-tail depredation hunt, a female friend shot a large lone doe which had been standing broadside not 75 yards distant. As the rifles report echoed in our ears, the doe inexplicably, almost nonchalantly, turned and trotted into the brush showing no signs of a hit. Fortunately, due to a foot of freshly fallen snow, finding her tracks posed little challenge. However, the perplexing tale those tracks told presented both my friend and I with an incomprehensible mental quandary that remains to this day! Astoundingly, after receiving a textbook perfect lung shot from a hotly loaded .270 Winchester, (140g ballistic tip at 3,000 + FPS-MV) that doe somehow traversed 65 yards of unblemished pristine snow without leaving any signs of a hit whatsoever ! Not a single speck of blood, not a lone strand of hair, nothing ! (Believe me, we looked hard.) Exactly 70 long steps from where she was initially hit, we found one dime sized ruby spot on the snow. Five strides beyond the first we found another one. Ten additional yards of undefiled snow and there lay the doe deader than a mackerel !!! As I said earlier, when tracking wounded game take nothing for granted ! If it were possible, I would like to tell you everything there is to know about tracking a wounded animal. Unfortunately, I don't know everything and even if I did there wouldn't be space here to write it all down. So instead, I will tell you something that is much more important.